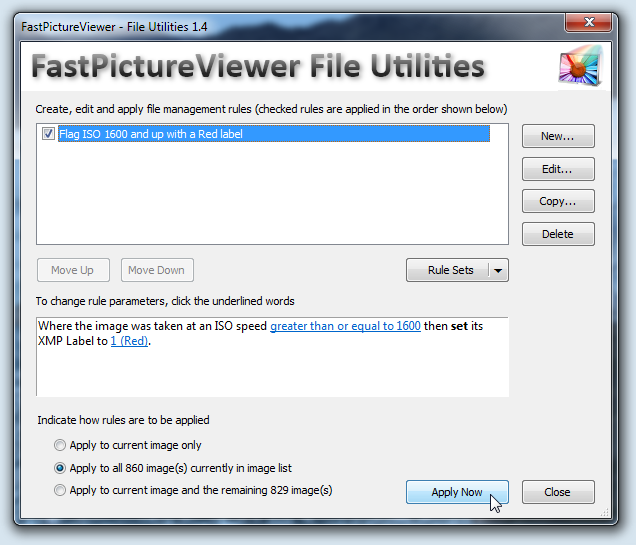 FastPictureViewer | View topic - How to: Flag all high-ISO files with a specific XMP Label? How to: Flag all high-ISO files with a specific XMP Label? A question was asked in the forum about flagging images taken above a given ISO speed with a specific XMP label. The File Utilities plug-in can be invoked using the Ctrl+F keystroke while viewing images, or from the taskbar's right-click context menu (in the Plug-Ins sub-menu). Rules similar to the above one can be created in a few mouse clicks, then be applied in batch to all image. Files matching the trigger condition will have the designated action applied to them (in this example, images where the EXIF information says the picture was taken at ISO 1600 or more will get a Red flag).